It was the beginning of the month of March, following Black History Month when the history of Blacks is most celebrated. 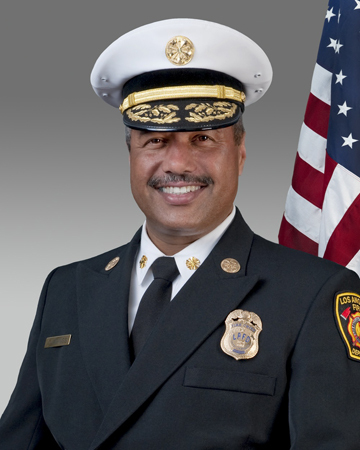 That fact was not lost on Los Angeles Fire Department (LAFD) Chief Brian L. Cummings, the third Black fire chief in the history of the department, when he sat down with the Sentinel. While the past three consecutive Black LAFD fire chiefs are a sure symbol of progress in one of the nation’s largest cities, the weight of the ugly racial injustices in a department that has been marred by fiscal cuts and scandal rest squarely on the shoulders of a man who is a third generational firefighter and one who embraces such challenges. Prior to that, there have been more than a few Black milestones in firefighter history, the first woman firefighter, Molly Williams in New York City in 1817, the first Chief, Patrick H. Raymond, was hired in 1871 in Cambridge, MA, and the legacy of Black firefighters was boosted again in 1876 when Trevor K. Hansford was hired as chief in the birth place of the Klux Klux Klan in Indianapolis. That was quite some time ago, and although a museum documenting Black firefighters was opened in 1997 on Central Ave. in Los Angeles, a bevy of racially charged incidences have tainted the LAFD in a way that perhaps will take even more than a Black chief or time to heal. Chief Cummings follows fellow Black chiefs Douglas Barry and Millage Peaks who were both appointed by Mayor Antonio Villaraigosa to lead the department. The department has come a long way from its brutal past tainted by segregation in the early 1950 and being central elements in both the Watts and Rodney King riots in 1965, and1992 respectively. The allegations of whites feeding dog food to a fellow Black firefighter a few years ago and the diminishing number of Blacks in the department are also fresh. However daunting the circumstances and fiscal challenges that face the department, current Chief Cummings is not just qualified, but also motivated to innovatively lead. “With every great opportunity comes a great challenge,” Cummings told the Sentinel. Many of the challenges facing the department probably will not become clear until voters settle upon whom the next mayor of the city will be. Nonetheless, the 31-year veteran who is the son of late retired LAFD Engineer, Lou Cummings, is willing and proven. Since joining the department in 1980, he has been promoted to the rank of engineer in 1988, Captain I in 1993 and Captain II in 2000. In 2003, he took command of the LAFD’s Battalion 13, managing five stations in South Los Angeles and it was there he built and sustained strong relationships with various community organizations, clubs and churches, as well as with the Los Angeles Police department and Los Angeles County Fire Department. “I want residents of our communities to feel welcome to come to a station, ask questions, take a tour and get to know our firefighters and the people who work there. It is essential for all of us to enjoy such a relationship,” said Cummings. In 2005, Cummings assumed command of the Recruit Training Section of the LAFD and during his tenure was instrumental in the development of the modular training facility located at the Frank Hotchkins Memorial Training Center while managing facilities in the San Fernando Valley, Downtown Los Angeles and San Pedro. By 2010, he had been assigned to the Planning Section of the LAFD where he oversaw the Fire Chief’s staff and assisted with management of the day-to-day functions of the LAFD. He coordinated research projects, staff studies and formulated the goals and objectives for the department. In December of 2010, he was promoted to assistant fire chief and then chief of staff, responsible for assisting in planning and implementation of short and long range goals. Now, that sole task of implementation belongs to him in a city with a population of close to 4 million, 40% residential, 6% industrial, 6% commercial, 17% streets, 6% public facilities and 17% open space. The assessed property value is a staggering $431.2 billion. His annual operating budget for the fiscal year of 2011-12 was $472,597,193 and it all comes out of general budget, but the department is one of the few that contributes more to the general fund than it consumes. There are a total of 3,361 firefighters of which only 52 are female, 388 are Black while Hispanics compose 1,080, Whites 1,735, Asians 189, Filipinos 54, Native Americans 14 and other 1. Cummings cannot specifically promote the hiring of Blacks, but he is aware of the department being just 11.2% Black and more than 50% white. Hispanics make 31.2% of the department. A native of Los Angeles who attended Loyola High School, West Los Angeles College and UCLA, Cummings said he would be encouraged to see more Blacks seeking an opportunity with the department. Cummings encourages African American youth to get prepared to apply. The LAFD has future opportunities and needs young people in this community to see firefighting as a viable career option, he said. Once trained and accepted, applicants must adhere to the LAFD motto of “Serving with Courage, Integrity and Pride.” Cummings already has adhered to this motto, and then some. He is doing great things in the department and in the community. The Black community ack­nowl­edges and supports his leadership. We salute Chief Brian Cummings for the great work he is doing at the LAFD. He is a local hero – one who shows pride in his work and who makes us proud!! !